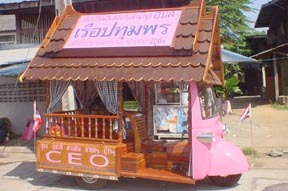 Doing a similar job to the taxi is Thailand's ubiquitous tuk-tuk ตุ๊กๆ). So named because of the sound of their engine, these are motorized rickshaws which are very popular amongst tourists for their novelty value. You may also hear the name "Sam Lor" (three wheeled). They are most always faster than taxis in heavy traffic as weaving in and out is easier, but in the heat of the day and the open air exposure to the exhaust fumes of the these and surrounding vehicles can make this a regretful experience, so USE DISCRETION. Without doubt they are the ultimate evening transport to see and hear and of course that thrill of these vehicles tacking from lane to lane. Fear not, the locals use the tuk-tuks frequently, they are well aware of their conveniences. Without any luggage, 3 people can fit into one fairly comfortably - it's possible to fit more in but it gets a bit cramped. Fares always have to be bargained for, and it is sometimes possible to bargain tuk-tuk drivers down to less than the taxi flagfall of 35B. Most times, they offer no savings over a taxi, except perhaps if you're good at bargaining and can speak good Thai. The initial price they quote is likely to be well over the going rate, but it's easy to bargain it down to a more reasonable one if you know roughly the equivalent taxi fare. It's essential to bargain the price with tuk-tuks before getting in. If you only ask after the ride, it's likely to end in a request for an ridiculous fare which can obviously lead to an unpleasant situation. Just like taxi drivers, the tuk-tuk drivers mostly come from the rural northeast of Thailand and don't have to undergo any training (some will not even have passed a driving test), so don't be surprised if they sometimes have no idea where your destination is. A subtle point to remember when in one is not to rest your feet on the rail near the drivers head, as doing so is extremely disrespectful towards the driver. As tuk-tuks are open-ended, they expose passengers to the high pollution levels in the middle of Bangkok's roads and offer almost no protection in case of an accident. 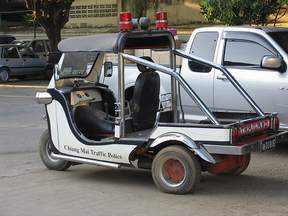 There is theoretically a ban on new tuk-tuks as they are so noisy and polluting, but it doesn't really seem to be being enforced at present. 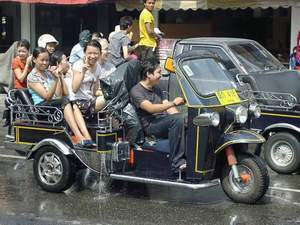 Nevertheless, many of the local residents are not too enamoured with tuk-tuks nowadays and, were it not for their popularity with tourists, the days of the tuk-tuk on the streets of Bangkok would surely be numbered. Fares vary, depending on the distance travelled, the time of the day, the traffic, and the mood of the drivers. Normally a very short trip will cost 30 baht. Fare negotiating and haggling is a must because the price named by the driver is always an 'inflated rate' (especially if you're a tourist). The trick is to negotiate 5 - 15 baht off the proposed fare, and take it from there. 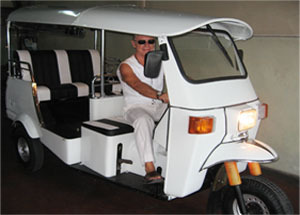 Be careful of the 'mafia' tuk-tuks around touristy areas, who often boasts privileged knowledge of 'secret' or 'special' shopping places and things. Some of them may offer sightseeing tours and unsolicited help to take you places. A short and sweet "no, thanks" will save you from their scams. The same rule applies to taxis. 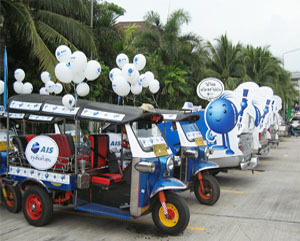 Avoid taking a tuk-tuk during peak hours (07:00 - 09:00, 16:00 - 19:00). You don't want to be stuck in traffic for hours, sweating and breathing in the hazardous fumes from engines all around you.